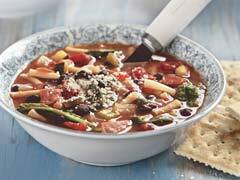 This tasty black bean minestrone soup delivers a lot of hearty ingredients in a single bowl, including ham, loads of veggies, and cheesy pasta. Combine beans, broth, tomatoes, onions, zucchini, celery, carrots, ham and red pepper in Dutch oven or stockpot. Bring to boil on medium-high heat. Reduce heat to low; cover. Simmer 10 min. or until vegetables are crisp-tender. Add water and Macaroni; stir. Cook 7 to 8 min. or until Macaroni is tender. Stir in Cheese Sauce Mix and spinach; cook 2 min. or until spinach is wilted, stirring occasionally. Serve immediately. Soup will thicken with standing. Add additional chicken broth or water to thin the soup, if desired. Sprinkle each serving with 2 tsp. KRAFT Grated Parmesan Cheese. Serve with saltine crackers. Substitute chopped Swiss chard for the spinach. Makes 3 qt. or 12 servings, 1 cup each.